300 meters from the airport(5 min. walking), 600 meters from train station (10 min. walking), 15 min. walking from Pisa historic center, 25 min. walking from Pisa tower. We have rooms with comfortable beds,clean sheets and blankets included . -After your reservation you'll receive a confirmation e-mail where you must inform your approximate time of arrival. -Payment on arrival only in cash. *Check-in after 11PM ON REQUEST. Excelente localização e staff muito atenciosos!! As simple as that: adorable place, family friendly, excellent location, in a walking distance from touristic points. Special thanks to Mr. Gilberto the manager of the hostel for all the help! The staff were friendly and helpful. 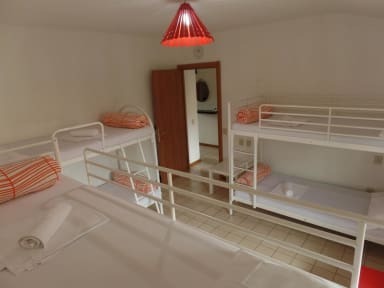 If you want a hostel very close to the airport and train station this is the one. Próximo ao aeroporto, atendimento ótimo, a limpeza espetacular (o hostel mais limpo que já fui), vale muito a pena! Ótimo pequeno hostel, muito bem situado, limpo, seguro, com uma atmosfera descontraída. Muito bom para quem está de passagem ou quer ficar uns dias em Pisa. O staff é muito atencioso e dão dicas úteis para melhorar a tua experiência. 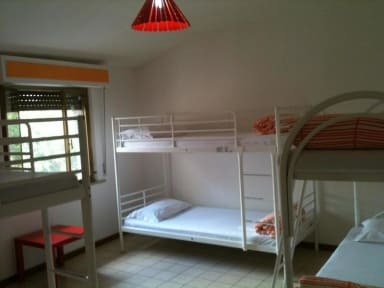 The hostel is really near the AirPort and in 15 minutes is also reacheable the centre of Pisa. Everything was really cleaned and the manager was very kind and usefull, giving advices and explaining everything was necessary. when we arrived the owner was asking for the full Price of the room but we already paid some percentage for the reservation and it was not good that we had to try to explaining that. Nice place, a bit far from the city center but very clean, light and organized. Although, I do advise you to pay some attention to the price they'll charge you, when you arrive. Oh and there's only one bathroom. The hostel had a good atmosphere and the owner was always around.